True or false, what you put on your feet is the most important decision you'll make on hiking or backpacking adventures? I'd argue it's certainly one of the essential things you have to get right if you're going to have a safe, enjoyable time outdoors. If you get the wrong pair of kicks, you risk blisters, a rolled ankle or two, even slipping and sliding your way down the trail. After my favorite pair of boots bit the dust in a big way on a backpacking trip, I went on a search for a replacement pair. I've had good luck with Ahnu shoes in the past, and after finding the Women's Montara Boot, thought they'd be worth a shot. The Ahnu Women's Montara Boot is described a lightweight mid-height boot designed to offer comfort along with the stability and traction necessary for backpacking and hiking. Weighing in at 14 ounces per boot, they're lighter than other heavy-duty backpacking kicks I've tried, but heavier than a standard hiking shoe. I could hardly tell they were there after I laced them up. 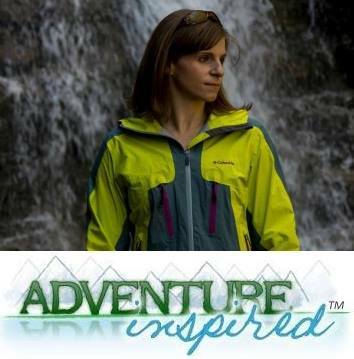 Though function should always take precedence over form, it's important to me to feel good in what I'm wearing on the trail. With respect to style and color schemes for the Montara boots, Ahnu knocked it out of the park. They're available in a variety of colors, but I'm partial to the dark grey pair I tried out. The purple laces and accents are a perfect contrast to the grey leather and black soles. They also fit true to size; I'm a women's size 10, and the size 10 pair I tried fit just right. I have narrow feet and found them slightly too wide, but not wide enough to cause issues with stability or comfort. Though the Montaras felt comfortable out of the box, on the first day of hiking, I noticed small hot spots on my heels as my feet moved inside the shoe. Since then, they've broken in more, but there'll likely be a short break-in period required if you're trying the Montaras for the first time. 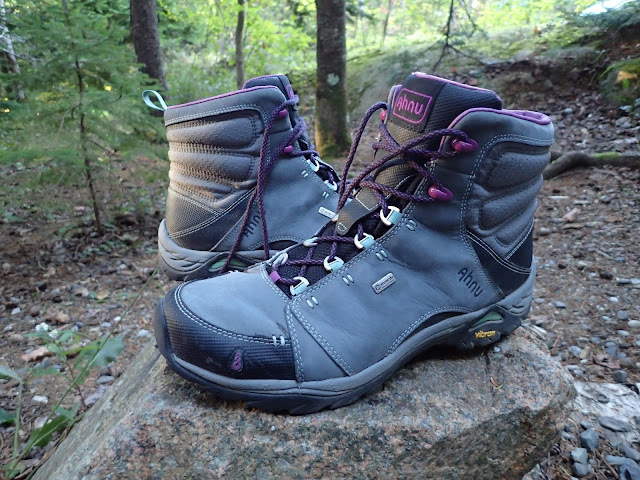 After a dozen miles on steep, rocky trails in Acadia National Park, the Montara Boots started to look broken in. The waterproof oiled leather creased slightly and the inside of the boots started to mold to my feet. The quick break-in period isn't a bad thing, but I also started to notice scratches on the boots from rocks I grazed on my hikes. 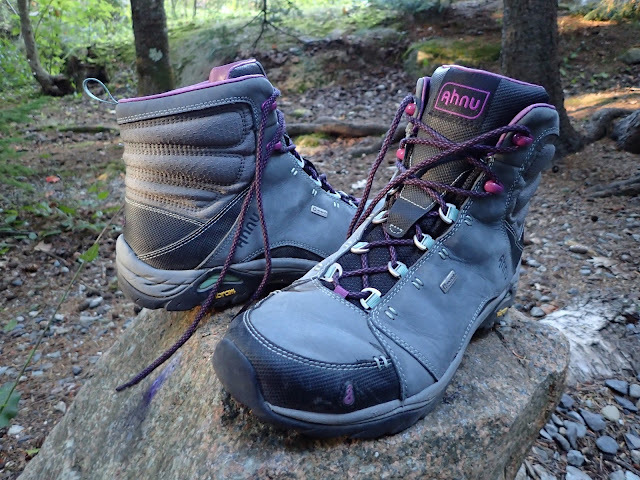 Ahnu's Numentum® HIKE technology, engineered to center and guide the foot without adding weight, also meant the boots kept my feet in alignment whether I was traversing downward sloping exposed granite down Cadillac Mountain or rock hopping up the Beehive trail. The padded tongue was a nice added feature, as was the eVent waterproof breathable liner. My feet stayed at a comfortable temperature despite the fact that I broke a sweat under the warm Maine sun ant 70ºF temperatures, and the boots weren't wet inside. The Vibram outsoles did their job, which meant my feet and I stayed firmly attached to the ground. The rubber toe protector was a welcomed feature after I kicked several large boulders heading down some of Acadia's rocky trails. The Montaras are also waterproof, and after spending a good few minutes standing in a pond, my feet were dry. However, some parts of the boots around the seams remained darker than the rest of the boots and dried after a few hours, which made me nervous about how they'd hold up during a long deluge of rain or on snow. The mid-height cut of the Montaras gave me a bit of added ankle support, but as the boots are flexible, especially after a few days of wear. They don't provide as much stability as a full height hiking boot would, and the sole bends depending on what you're stepping on. The boot flexibility wasn't an issue for me on the trails I tested them on, but if you're prone to rolling ankles on hikes, or like more ankle support when you're carrying a heavy load, it's something to consider before trying these kicks. Bottom line? 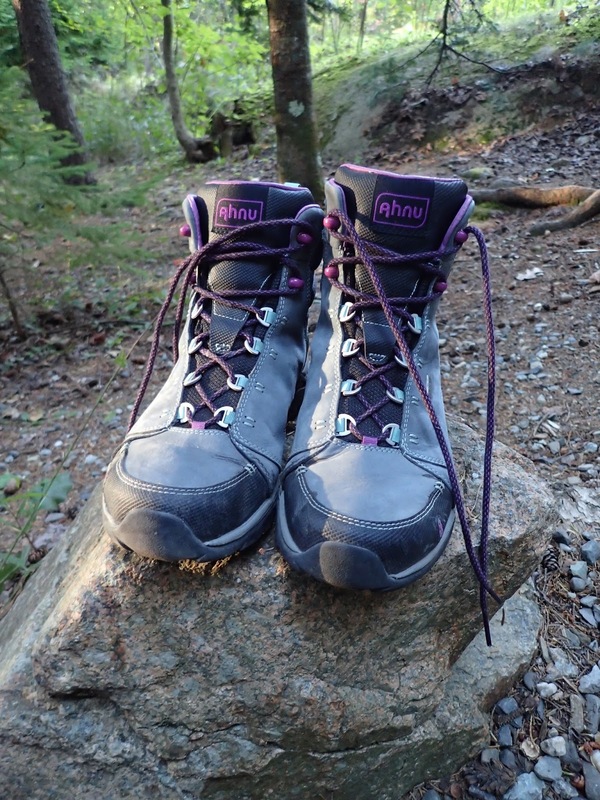 The Ahnu Women's Montara Boots are great lightweight boots that provide more ankle stability than your average hiking shoe, but if you're headed on a long backpacking trip with heavy loads, I'd recommend something a bit sturdier. They're designed for hiking and backpacking with loads up to 40 pounds, but I can see myself using the Montaras for trips that involve carrying lighter loads and/or day hiking in cooler months. I'll also update this review as I'm able to get out in wet weather and see how the waterproofness holds up. Many thanks to Deckers Brands for providing me with a complimentary pair of Montara boots to test. As always, the opinions expressed here are my own. What do you think, would the Montara boots work for you? Are you an Ahnu fan? We'd love to hear from you!